John Kerry: Kerry staunchly resists restrictions on abortions. John Kerry: Questions the ultimate practicality of affirmative action. John Kerry: Defense of Marriage Act is fundamentally ugly. John Kerry: Key issue: Does government control reduce cost? John Kerry: Clear separation of church and state. John Kerry: Kerry saves life under fire, awarded Bronze Star. John Kerry: Anti-Vietnam but not left-wing anti-war. John Kerry: Supported 1998 missile attacks against Afghanistan & Sudan. John Kerry: Afghanistan incursion justified and not the same as Vietnam. 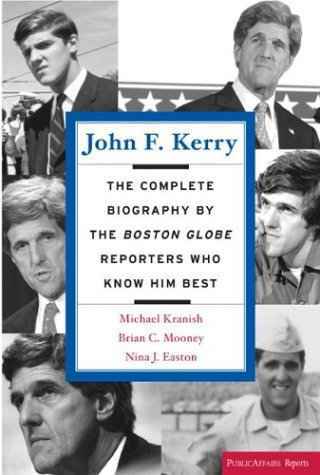 The above quotations are from John F. Kerry: The Complete Biography By the Boston Globe Reporters Who Know Him Best, April 2004.